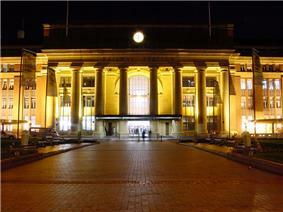 Wellington Railway Station Frontage at night, 14 May 2003. Wellington Railway Station is the southern terminus of New Zealand's North Island Main Trunk railway, Wairarapa Line and Johnsonville Line. In terms of number of services and passenger numbers it is New Zealand's busiest railway station. Wellington's first station, Pipitea, was built in 1874 as part of the railway line to the Hutt Valley. This station building burnt down in 1878 and was replaced in 1884 by what became known as Lambton, built by New Zealand Government Railways to service the Wairarapa line. In 1886 Thorndon station was built by the private Wellington and Manawatu Railway Company, purchased by the New Zealand government in 1908 to incorporate the line into what became the North Island Main Trunk, via Johnsonville. Once both stations were in government control public pressure began to build for a single terminal. The government decided on a co-ordinated development that included a new station building, and after agreement in 1922 between the Railways Department and the Wellington Harbour Board, the reclamation of about 68 acres (28 hectares) to incorporate a new double-track railway, train marshalling areas, goods yards and sheds. This reclamation from the sea at Thorndon began in 1923 and was on track to be completed by 1932, which allowed the government in 1929 to confirm that Bunny Street would be the location of a new station which would remove the inconvenience of the two separate stations. Goldsmith, Paul (2009). Fletchers – A Centennial History of Fletcher Building (hardback). Auckland: Davia Ling Publishing. p. 352. Smith, Jack (2009). No Job Too Big – A History of Fletcher Construction Volume I: 1909-1940 (hardback). Wellington: Steele Roberts. p. 342. ^ "New Zealand Railways Corporation – Results for announcement to the market" (PDF). 30 August 2013. Retrieved 21 October 2013. ^ Smith 2009, p. 194. ^ Smith 2009, p. 195. ^ Smith 2009, p. 198. ^ Smith 2009, p. 196. ^ Smith 2009, p. 197. ^ Smith 2009, pp. 198 and 330. ^ a b c "Wellington Railway Station". Register of Historic Places. The bus terminal, formerly Lambton Interchange, is served by most Wellington bus routes and is connected to the station by a subway under Featherston St.
KiwiRail Scenic Journeys operates two-long distance services from Wellington up the North Island Main Trunk. The Capital Connection service operates to Palmerston North once daily on weekdays. The Northern Explorer service operates to Auckland Britomart three times per week. Two companies operate train services from Wellington. The station copes with large daily passenger numbers with very little alteration having proved necessary. In its first year, 7,600 passengers made 15,200 trips on 140 trains daily. In the 1960s it was estimated that over 42,000 people used the station each day. Today, 29,000 passengers make 44,000 trips on 390 trains, excluding long-distance services. The New World Railway Metro supermarket occupies part of the ground floor. It was built to accommodate the head office of the New Zealand Railways Department and is the Wellington office of its successor, the KiwiRail, which occupies the east wing, Victoria University of Wellington the west wing. The station was used in a 2009 TV advert in the United Kingdom for train ticketing company TheTrainLine, where a large flock of sheep use the facilities. The station was registered on 25 September 1986 as a Category I Historic Place. In 2010 the former social hall was converted into 660 square metres of boutique office space. On 4 December 2006 the New World Railway Metro supermarket opened on the ground floor. This coincided with the closure of the Railway Kiosk and the American Hotdog vendor. Between August 2003 and October 2008 the building was refurbished at a cost of NZ$14.6 million to house part of Victoria University in the West wing and Toll NZ (now KiwiRail) in the East wing. This work included a seismic upgrade, restoration and refurbishment, and installing three new lifts and a dedicated access in the south west corner to the university wing from the concourse. The architect was Athfield Architects with construction undertaken by Fletcher Construction. As part of this reorganization of the building the 24-hour train control centre was relocated from the western wing to the eastern side of the southern part of the building. In 1991, as a result of a major restructuring of the New Zealand Railways Corporation, ownership of the land and buildings was retained by the Railways Corporation while a new organisation known as Tranz Rail Holdings Limited in 1995. In 2000 Tranz Rail moved to its head office to Auckland, but retained space for operational management of the railway network. In 2004 Tranz Rail was sold and renamed Toll NZ Ltd, which then sold the track and infrastructure back to the Railways Corporation. As part of the creation of the WestpacTrust Stadium (completed November 1999) on surplus railway land to the north of the station an elevated walkway from Thorndon Quay to the stadium was installed with access via ramps from platforms 3/4, 5/6 and 7/8. To facilitate this work the canopies of platforms 7/8 and 9 were shortened to the same length as platforms 3/4 and 5/6. In 1988 the Railways-run bookstall and cafeteria were closed with subsequently the barber's shop and men's toilets being converted into 'Trax Bar and Cafe', while the women's waiting rooms were converted into toilet blocks. The original dining hall and kitchen were converted to office space. At about this time platforms 2 to 7 were shortened at the concourse end to provide increased space for waiting passengers. Large concrete planter boxes were installed at the end of the tracks to assist in stopping runaway trains. In 1982 the New Zealand Railways Corporation replaced the Railways Department. The application of a more commercial attitude to the running of the organization resulted in a large reduction in staff employed at the Wellington Railway Station. Due to the reduction of railway staff numbers in the 1980s large parts of the building became under utilized. The station was opened on 19 June 1937 by the Governor-General of New Zealand, Viscount Galway. Lambton closed on 19 June 1937 and Thorndon on 8 June 1937. A two-storey brick building with a mansard roof containing a social hall and a garage was built in 1937 facing Waterloo Quay to the north of the East wing, at a cost of £15,000. The garage was on the ground floor with the social hall occupying part of the ground floor and the entire first storey. The garage also incorporated rooms for the chauffeur to the Railways Departments General Manager. In August 1938, to accommodate increasing staff numbers, work commenced on the construction of the section of the Featherston Street Wing removed from the original design to reduce its cost. This was undertaken as a separate project at a cost of £59,662. The contract was expanded to include the construction of an electric substation (commenced 1936) at a cost of £2022 and a locomotive maintenance workshop (commenced 1936) along the Thorndon Quay side of the railway yard. This cost £37,406 and is still in use. Progress was rapid, with 1500 of the piles driven by the time the foundation stone was laid on 17 December 1934 by the Duke of Gloucester, an occasion witnessed by an estimated 5000 people. Work commenced on site on January 1934 with a workforce of 12, which built up to 161 in January 1936. Fletchers reduced the cost of the construction steel to £70,000 from an estimated £85,000 by directly importing it rathethan purchasing it from local steel merchants, and had it fabricated on site by Wm Cable Ltd.
Fletchers appointed 26-year-old Joe Craig to manage his first major project. His prior experience had been on the construction of Chateau Tongariro, Massey College and earthquake reconstruction in Hastings. His management skills, supported by a large team of experienced foremen and a close working relationship with the architect, ensured that construction progressed very smoothly on a project that was very profitable for Fletchers. Fletchers was awarded what was believed to be the largest single-building contract let in New Zealand up to that time, to which a performance bond of £3000 was applied. The construction tender closed on 25 September 1933, extended by two weeks in an attempt to encourage local manufacturers to offer locally manufactured materials. Twelve tenders were received, with Fletcher Building the lowest at £339,000. The next lowest was £350,000 from J T Julian & Son, who had constructed a significant part of the Auckland Railway Station. A park was created in the forecourt with lawns and paths of paving stones with brick edging arranged in a herringbone pattern. The platforms, designed to accommodate up to 12 carriages, are made of concrete covered with a sealed surface under verandahs held up by railway irons. When completed the station was New Zealand’s largest building, partly covering 0.6 hectares and with a combined floor area of two hectares. It was designed to accommodate the 675 staff of the Railways Department head office and the Wellington district office, which until then had been accommodated in 11 leased buildings throughout the city. The glazed-roof concourse contained waiting rooms and toilets, a large dining room, a barber shop, book and fruit stalls and a first aid room. There was a nursery on the top floor to allow parents to leave their children while they shopped or waited for their train. The main entrance is on the south side via a colonnade of eight 13-metre- [42-foot]-high Doric columns opening into a large booking hall decorated with delicately mottled dados extending to a high vaulted ceiling. The building is a U-shaped structure with the longest leg 105.5 metres [346 feet] long and 23.5 metres [77 feet] high. Because of delays in importing the specialized boring equipment needed to install the cast-in-place piles called for in the original design, the decision was made to use 1615 15 x 15 inch and 16 x 16 inch reinforced concrete piles. These were driven by a steam-powered hammer. On top of the piles a five- and six-storey steel-framed structure was built. The steel was encased in reinforced concrete and 1.75 million bricks. 21,000 cubic yards of aggregate from the Hutt River with cement from Whangarei were mixed on site to create the concrete. The bricks used for the outer cladding were of a special design, with slots to accommodate vertical corrosion–resistant steel rods that reinforced the brickwork and bound it to the structural members. 1500 tons of decorative Hanmer and Whangarei granite and marble were used to clad the interior and the entranceway. 2500 gallons of paint were used. The roof was clad in Marseille tiles. Gray Young was paid a 4% fee based on the originally estimated cost of £470,000. This cost rose to £483,000 once the quantity surveying firm of Maltby & Sommerville complied a detailed quantity schedule, for which they were paid 1% of the estimated cost. Because of the impact of the Depression on Government finances it was decided to reduce the cost by eliminating a mailroom and a section of the West wing along Featherston Street and by transferring the £28,000 cost of the platforms and verandahs to a separate budget. As a result, the official estimated cost of the station was reduced to £350,000. To encourage employment of workers out of work due to the Depression the project received a subsidy of £34,000 (10% of the estimated cost) from the Employment Board. As the planned location was on reclaimed land, test piles were driven in 1928 to test the quality of soil. On the basis of the test results the decision was made to use Vibro cast-in-place piles to support the structure. The building was the first major New Zealand structure to incorporate a significant measure of earthquake resistance.